A trio of devils were having fun hurting my cats. 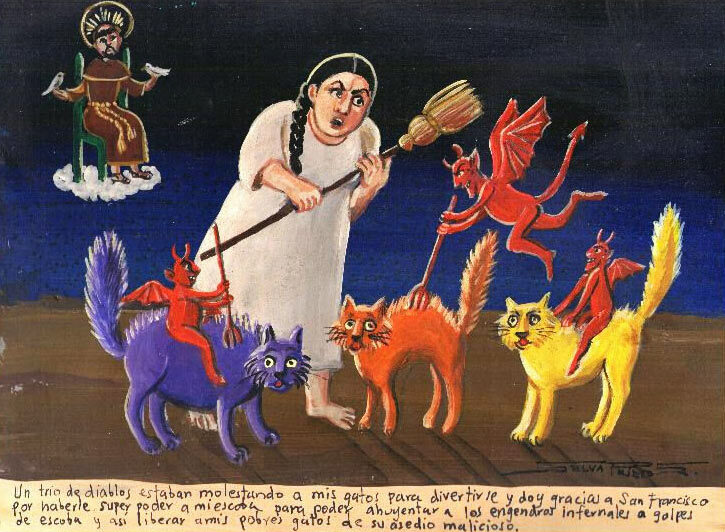 I thank the Saint Francis for giving my broom a celestial power so I could sweep those infernal creatures away and saved my cats from suffering. I’d never had such an abundant crop of peaches like this year. 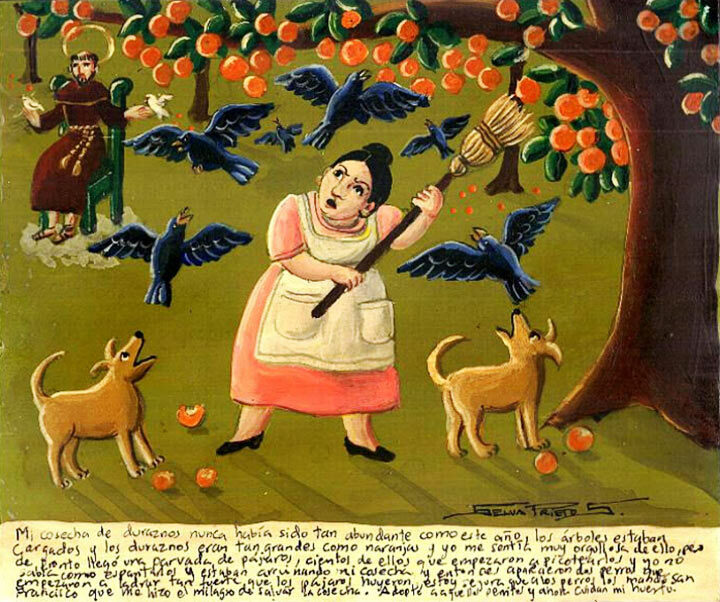 The trees were loaded with peaches, and the fruits were big as oranges. I was very proud, but then suddenly came a flock of birds. There were hundreds of them, and they began to peck my peaches. I didn’t know hot to scare them away. They were ruining my crop. Then two dogs came and started barking so loudly that the birds flew away. I’m sure it was Saint Francis who sent me these dogs and worked the miracle of saving my crop. I adopted these dogs, and they guard my garden now. Alejandro Gomez worked delivering water jugs. But one day he step over a banana peel and injured his back. He thanks Saint Francis for the recovery and because he was paid for his disability. I went to camp in the mountains alone. The morning I was mortally terrified when I saw an enormous bear near my tent. I thank Saint Francis because the bear entertained himself with my beer cans and fell asleep afterwards so I could escape from this situation unhurt. 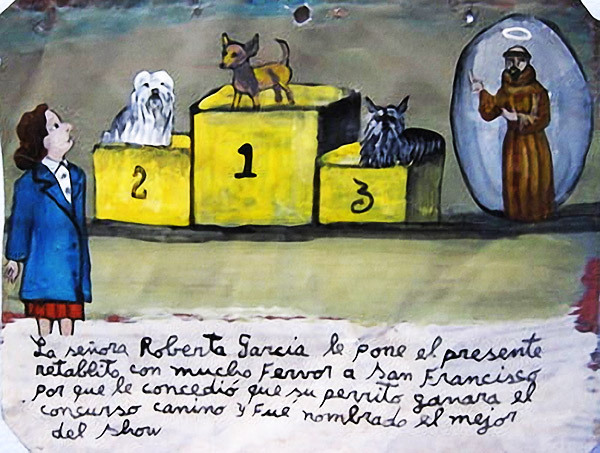 Señora Roberta Garcia brings this retablo to Saint Francis thanking him because her little dog won the contest and was named the best of the show. 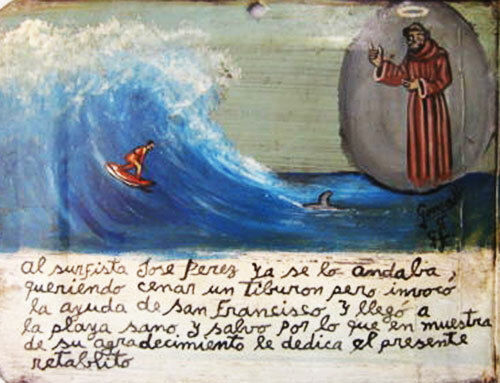 The surfer Jose Perez was about to be eaten by a shark. 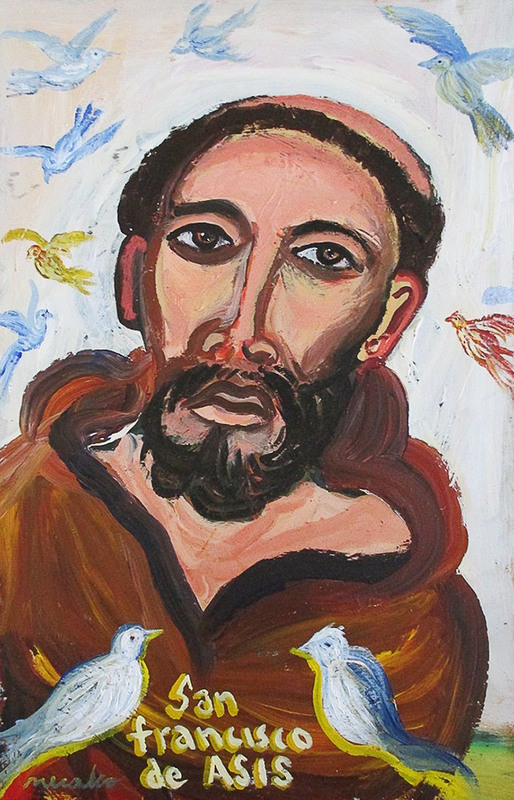 He prayed Saint Francis and got to the shore safe and sound. 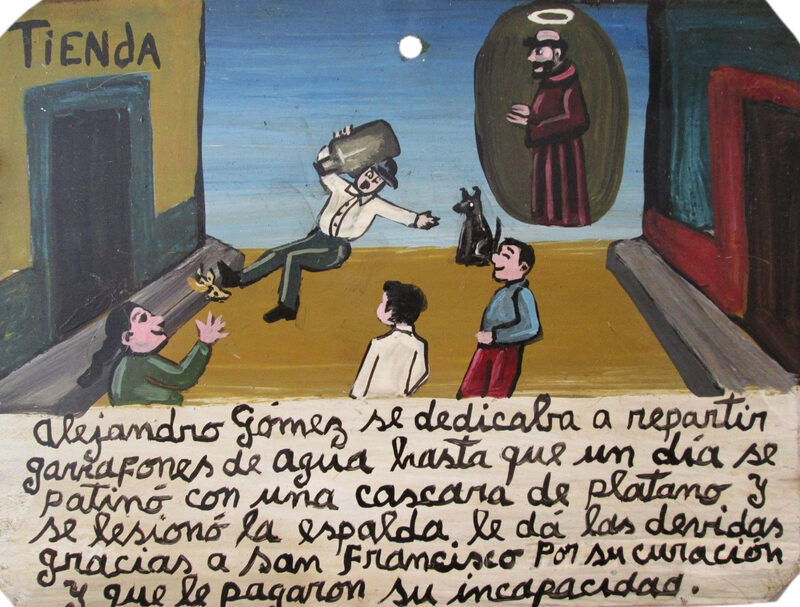 He brings the retablo for that. 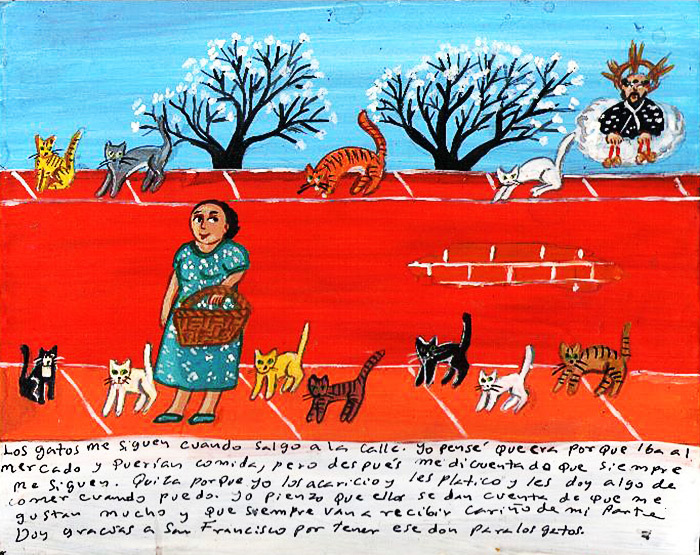 The cats always followed me on the street. I thought they did it because I was coming back from the market and they felt food. But then I noticed they always followed me. Probably because I care about them and talk with them, and leave them something to eat whenever I can. I think they know I like them and always caress them. I thank Saint Francis for sending me this company. The music is an important element in our family. It always with us, and we love playing musical instruments near the birds. They start singing, and it sounds so beautiful all together. I thank Saint Francis for my children having inherited the musical talent. 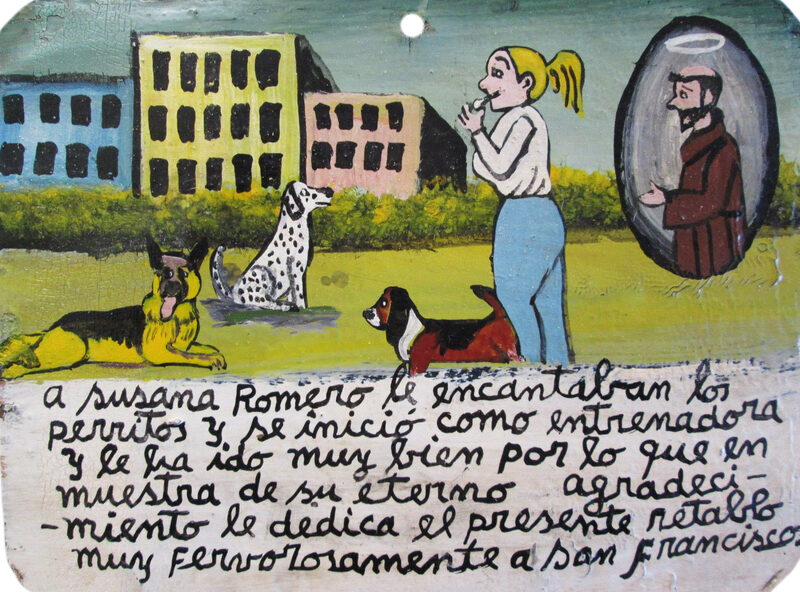 Susana Romero loved dogs, and she became a dog instructor. 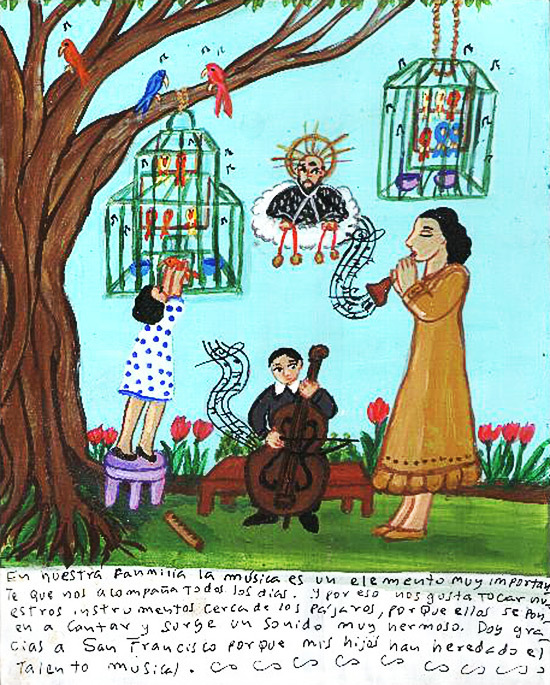 The thing have been going very well for her, so she dedicates him the present retablo to Saint Francis in sign of her gratitude. 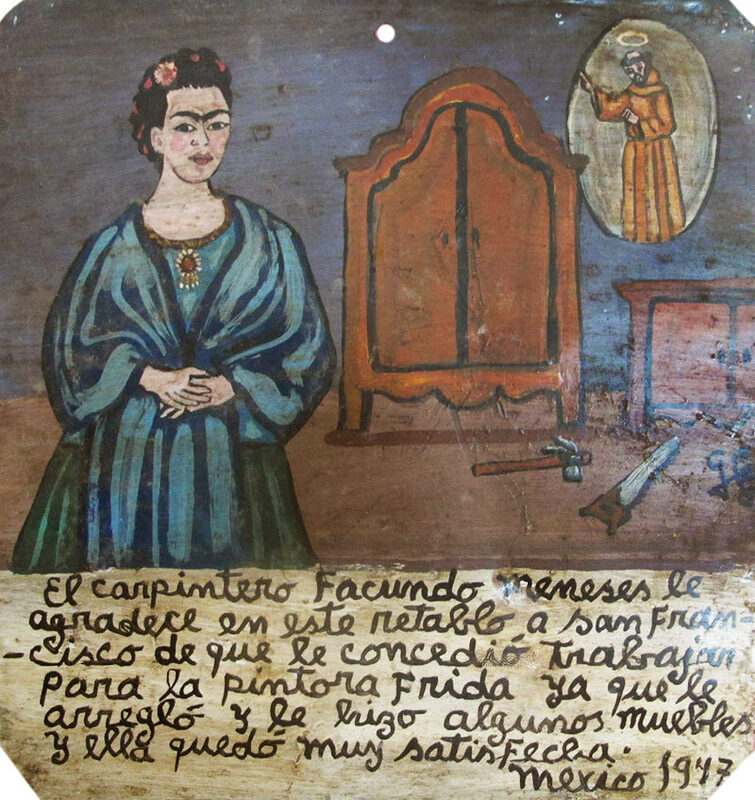 The carpenter Facundo Meneses thanks Saint Francis with this retablo because he had to work for the artist Frida and repaired some furniture for her. She was very satisfied. 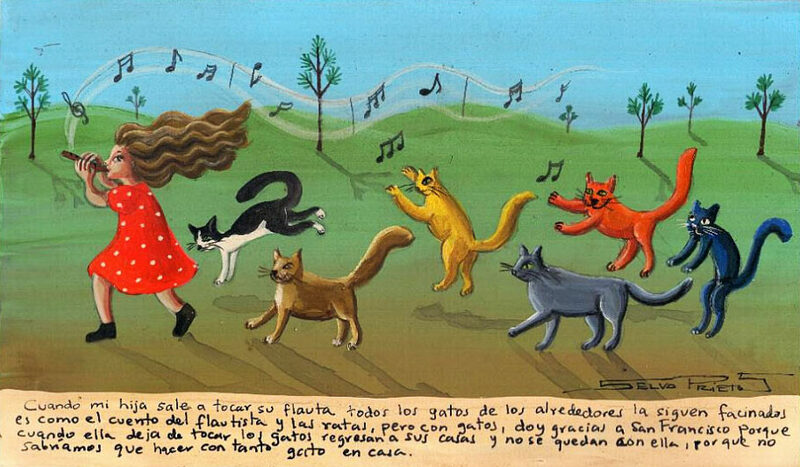 When my daughter comes out to play her flute, all the cats from the neighborhood follow her like enchanted. It’s all like in that story about the piper and the rats, only with cats. I thank Saint Francis because as soon as she stops playing the cats go back to their homes and don’t stay with her. Otherwise, we’d have no idea what to do with so many cats in the house. 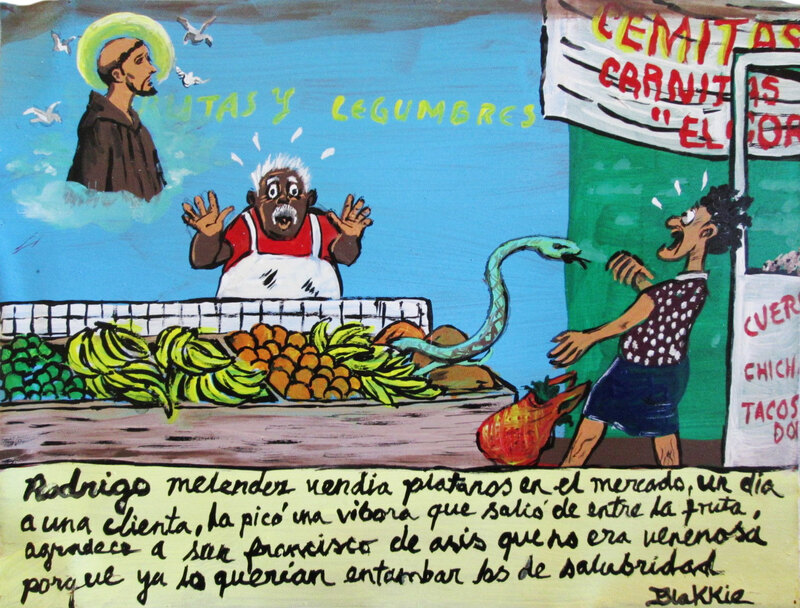 Rodrigo Menendez was selling bananas at the market, and one day one of his customers was bitten by a viper that got out of the fruits. He thanks Saint Francis of Assisi for this snake turned out to be non-venomous because the health control was going to throw him in jail.